Lockheed Martin has completed building the primary structure of the MAVEN (NASA’s Mars Atmosphere and Volatile EvolutioN) spacecraft at its Space Systems Company facility near Denver. The MAVEN spacecraft is scheduled to launch in November 2013 and will be the first mission devoted to understanding the Martian upper atmosphere. The mission’s principal investigator is Bruce Jakosky from the Laboratory for Atmospheric and Space Physics at the University of Colorado. The primary structure is cube shaped at 7.5 feet x 7.5 feet x 6.5 feet high (2.3 meters x 2.3 meters x 2 meters high). Built out of composite panels comprised of aluminum honeycomb sandwiched between graphite composite face sheets and attached to one another with metal fittings, the entire structure only weighs 275 pounds (125 kilograms). At the center of the structure is the 4.25 feet (1.3 meters) diameter core cylinder that encloses the hydrazine propellant tank and serves as the primary vertical load-bearing structure. The large tank will hold approximately 3,615 pounds (1640 kilograms) of fuel. Despite the primary structure’s light weight, it’s designed to support the entire spacecraft mass during the launch, which applies an equivalent axial force at the launch vehicle interface of approximately 61,000 pounds when including accelerations up to 6 Gs. After completion of the static tests, the structure will be moved into a clean room to start propulsion subsystem integration. 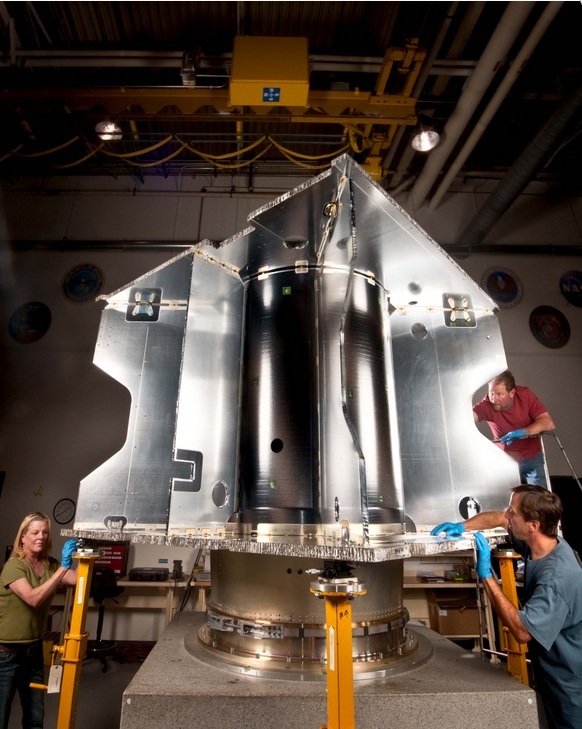 The Assembly, Test and Launch Operations (ATLO) phase begins July 2012.